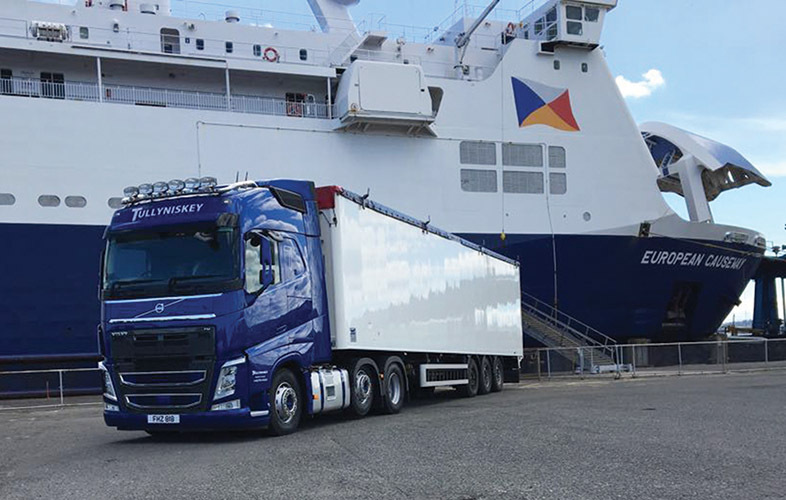 Established in February 2017, Tullyniskey Transport is a specialist bulk transport haulage company which runs a fleet of five articulated trucks, including a brand-new Volvo. Supplied by Dennison Rentals on contract hire, this stunning FH500, 6x2 comes with twin pipe hydraulics, leather interior and a microwave. The custom metallic paint makes this truck a real head-turner and is finished impeccably with subtle sign writing. The Volvo was immediately put to work on the Continent where Tullyniskey Transport has a growing customer-base. Its driver is Philip Aiken, father of company founder Neil Aiken. “He’s been driving trucks all his life and says this is the best he’s ever driven. He’s very happy with the comfort, power and fuel economy it offers,” Neil says. Based just outside Castlewellan in Co. Down, Tullyniskey Transport provides a top-class bulk transportation service throughout Ireland, the UK and Europe. It transports everything from peat and scrap metal to fruit and veg and palletised freight. Along with the new Volvo FH500, Neil runs three Volvo FH460s and a Scania R440, which was the first truck he bought. He also has six walking floor trailers – five STAS and one Knapen – and a Fruehauf bulk tipper. Neil can’t emphasise enough the important role his drivers Willie Dowie, Rolandas Lubickas, Sydney Collins and the aforementioned Philip Aiken have played in helping to get his fledging business off to a flying start. “We wouldn’t have grown as quickly as we have without good drivers. 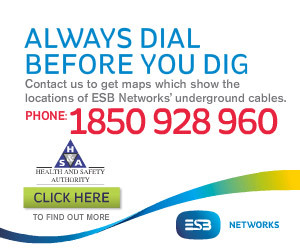 I’m very lucky to have the lads I have because, as everyone in the industry knows, good drivers are hard to come by. You cannot give a quality service without having quality staff,” he points out. Walking floor trailers have a number of advantages over standard truck bodies. A type of ejector trailer, the main advantage of the walking floor trailer is its ability to discharge the load without raising the trailer. They provide an efficient solution for loading and unloading loose material without requiring any additional equipment. They are also suited to accommodating bigger and longer loads, enabling them to be removed from the load space without requiring side panels to be opened or removed completely. The Tullyniskey Transport fleet is serviced and maintained by Brian Connell Engineering & Commercial Repairs. The Mayobridge-based company also supplies spare parts, while Neil buys his tyres from O’Hare Tyre Service in Dromara. Having been around trucks and fascinated by them from a young age, Neil is doing something that he loves. He started his working life as a joiner before the recession hit and then operated an excavator before taking up his first driving job with FS Herron Ltd, which is run by his uncle David Aiken. FS Herron Ltd produces high quality animal feeds for cattle, sheep, pigs and horses which are delivered throughout Northern Ireland. Neil then worked for Paddy Laverty of LPL Bulk Haulage where he learned all about walking floor trailers. When Paddy retired, he decided to go out on his own and bought his three Volvo FH460s from him. Specialising in local and overseas bulk transport, Tullyniskey Transport provides tailored transport solutions for your specific needs. Neil would like to take this opportunity to thank his customers for their support to date and looks forward to continuing to work for and with them for many more years to come.